So I’m searching high and low in the workshop for a couple of things, things I recall putting away but now can’t find. Driving me batty, but there was a silver lining – I found the W.German trenching tool that had gone awol for the last few years. It was a necessary bit of kit for the van and during it’s absence I was forced to use my back-up, an E. German trenching tool. BTW, the pair are on my old sliding crosscut table on the table saw. It’s what I use when cutting aluminum on the saw. OK, West on the left, East on the right. West uses a spring loaded push button mechanism to adjust/lock blade angle. East uses a threaded collar. 1965? Almost as old as me. Western tool has an independently adjustable pick. 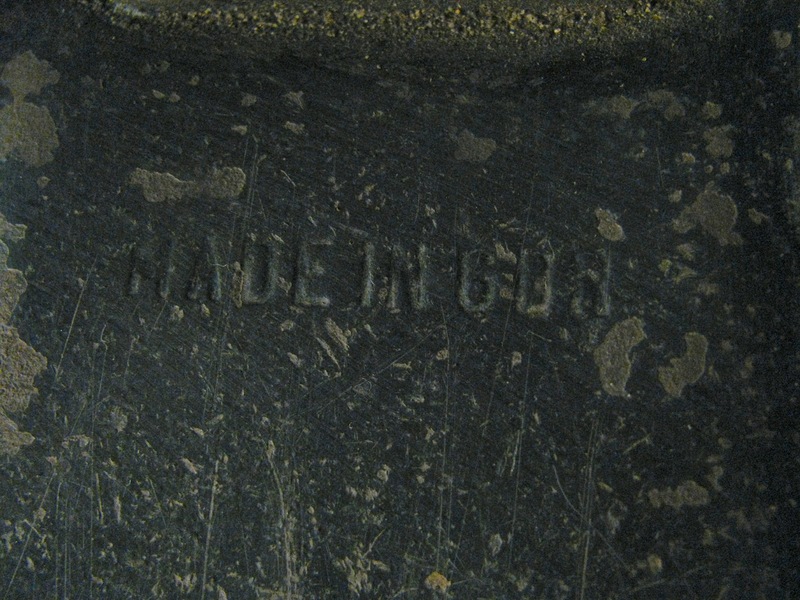 Only markings on the Eastern tool “Made in GDR”. This is strange, why would it be in English? An export model? The wooden handle on the GDR tool looks like it is Beech. A more pronounced grain on the W. German model, perhaps Ash. 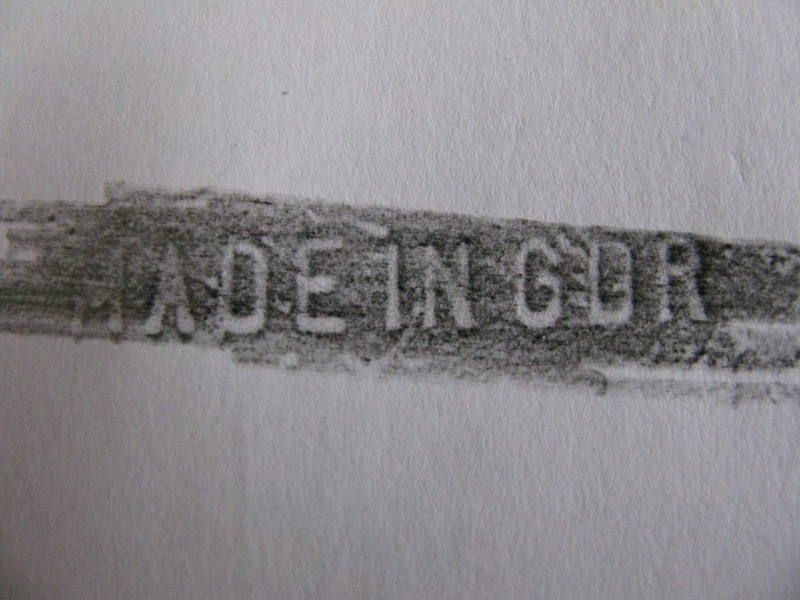 Addendum: for those out there questioning the “MADE IN GDR” stamp, here is a rubbing. 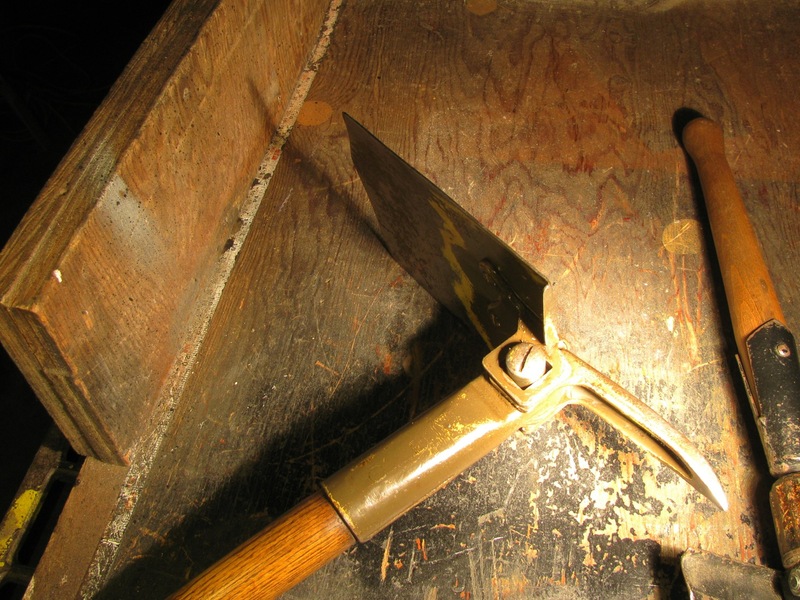 I’m thinking the shovel is an export item, made for the military surplus market. This entry was posted on November 28, 2013, 7:59 pm and is filed under tools. You can follow any responses to this entry through RSS 2.0. You can leave a response, or trackback from your own site. 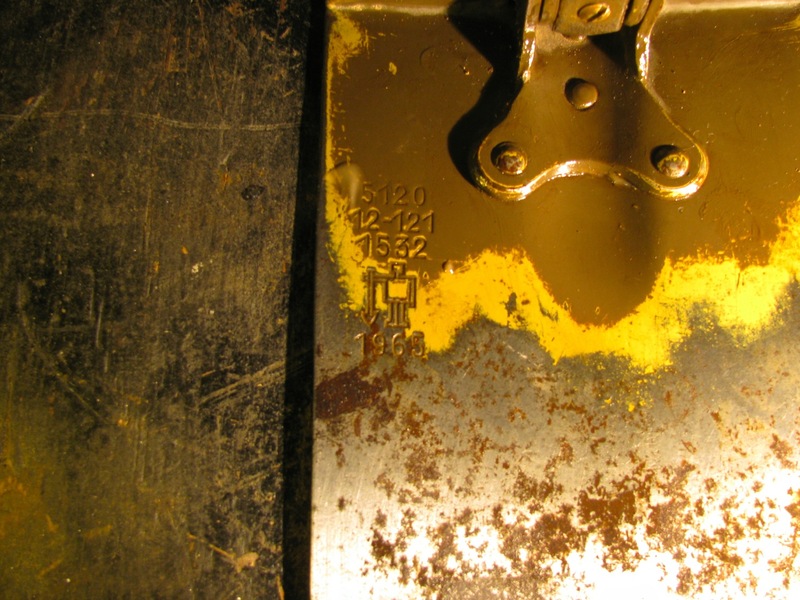 My US 1945 tool was the screw down collar type, the handle broke and the main part was lost before I got another one. A good tool. The screw collar locking mechanism works ok. But I like the push button mechanism even though it doesn’t always want to push in completely, and I think it is a bit more susceptible to dirt. I replaced the broken (then lost) entrenching tool with a short ‘D’ handled shovel from HomeDepot. 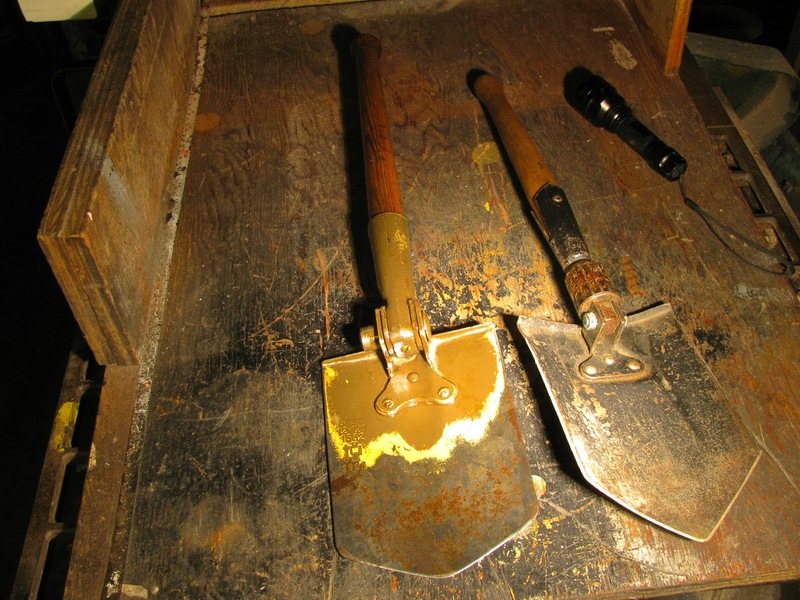 It’s a little longer than the entrenching tool but fits under the rear seat. I haven’t had to dig myself out with it so having it with me is just for that warm fuzzy feeling you get when you KNOW you’d have gotten stuck if you didn’t have it. That large screw down collar offers a lot of support if you were going to use the shovel at 90 degrees as a pick, I’d guess the button is hefty enough to do the job and quicker to swap over if you were digging a hole because you were really excited….